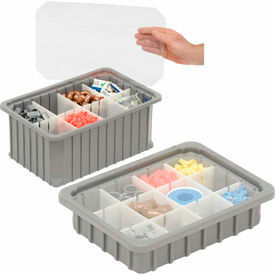 Akro-Mils Plastic Grid Dividable Boxes Help Organize Small Parts Easily and Efficiently! Akro-Grid dividable containers are injection molded from high density polyethylene for strength and durability. These plastic storage boxes resist most solvents and chemicals. Ribbed sides provide strength when loaded or stacked. 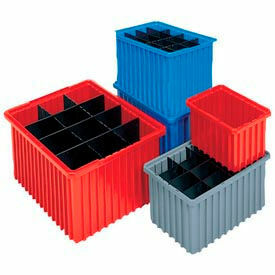 These grid containers divide into 1-1/8 squares using Optional Dividers to provide multiple compartments for parts organization. 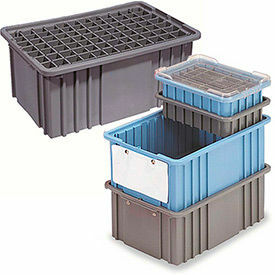 Modular boxes allow stacking with or without optional Lids. Optional Clear Covers easily snap-on to protect contents while offering quick identification of inventory. Grid boxes are compatible with most racks, shelving and automated material handling equipment. Optional Black Plastic Dividers and Lids sold separately. Sold in carton quantities. LewisBins™ Divider Box Kits Help Store And Organize Various Items By Creating Separated Compartments Within The Container. 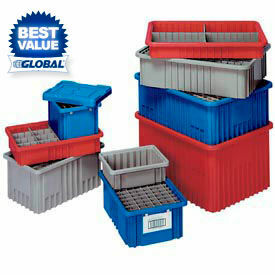 Multi-purpose stack-only LewisBins™ Divider Box Kit includes one carton of Divider Boxes. Each box comes dividers, snap-on cardholder and heavy duty clear cover. 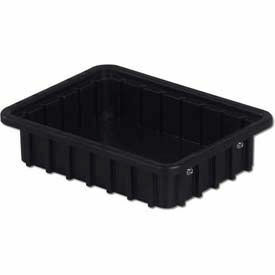 Divider Boxes can be divided into compartment using molded-in slots on 1-1/4" centers that accept Long and Short Dividers. Manufactured in high-density polyethylene, these dividable containers are ideal for use in commercial, industrial, electronics and healthcare markets for storage, assembly, fabrication and distribution applications. Strong stacking ridge and innovative ribbed walls ensure high performance. Load capacity of 40 lbs. per container. Vertical Box Dividers subdivide LEWISBins+ divider boxes to increase part protection and prevent part migration. Vertical dividers help to maximize efficiency and flexibility. Durable Clear Lids with molded-in tabs on one side that hook under container lip to guide the cover into place. Ensure easy visual inspection of contents. Snap-On Cardholders are envelope style with two snaps. All have a clear window with solid back. The Cardholders attach securely to any size conductive divider box allowing easy identification. Dandux Nesting Dividable Containers save Space While Providing the Maximum Use of Storage. These modular containers help simplify storage problems with multiple compartments. Grid boxes are made with vacuum-formed plastic. 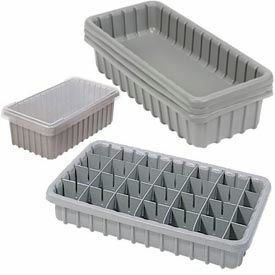 Gray molded polyethylene plastic storage boxes and dividers are made to last (sold separately). Optional Dividers are slotted on 1-1/4" centers. Optional Covers are made with clear plastic for viewing contents (sold separately). 17-3/4"L grid boxes fit standard 36"W x 18"D shelving. Inside dimensions are approx. 2" less than overall size shown. Divider Boxes are sold in carton quantities.